It took me 6 months. I trooped through. I conquered. I have read every single page of those five daunting books and have officially been pulled into the cruel grasp of George R.R. Martin. Let me just say, it’s been a battle– pardon the puns. Granted, it took me 19 years (the first book was published in 1996) to jump on this bandwagon. I don’t know what it is, but the majority of popular books sit on my “to-read” shelf much longer than books that no one talks about. I think my ego takes it as some slight that I’m not discovering something on my own, but having it pushed on me by popular culture– or in this case my friends and family. That said, once I committed to the first book I was determined to whiz through them. The books sucked me in more than I would have liked, and I found myself falling for characters knowing they would end up dying. See, that’s the thing with getting on this particular bandwagon. I had my fiancé read Game of Thrones (the first book) before me, and he absolutely hated it because he heard everyone dies. So while Martin’s storytelling keeps you enthralled, and you want to know what happens next, M didn’t want to go through the trouble for all the characters to end up dying. Martin creates an incredible world, right up there with LOTR (OK maybe not quite, but awfully close!). My fiancé hated it because of the spoilers. The Song of Fire and Ice series has an infamous reputation with all the characters dying– in swoops and swarms. Even though you know it’s coming, you somehow don’t see it coming. After reading the first book for myself, I actually felt hopeful that people were just being overly dramatic about it. Then I found this on Pinterest. 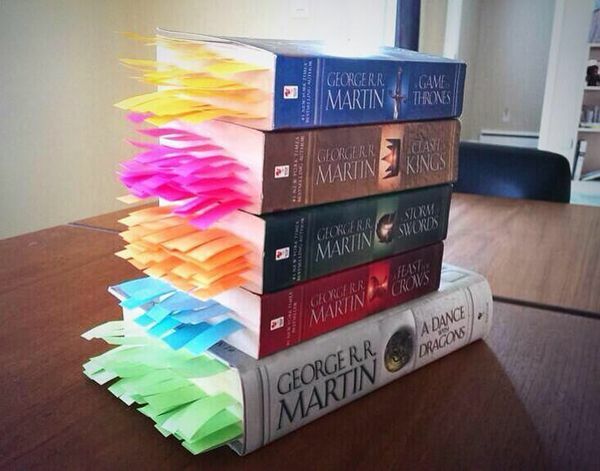 Someone went so far as to mark every time a character died in the book. It’s ridiculous. In this case it’s a little extreme because they obviously marked the death of both small and main characters. Still, my fiancé read the first book and went through the turmoil of “watching” while his favorite characters died. He warned me it would get worse. I didn’t listen. Martin pulled me in. He made me loathe characters and he made me love characters. And then he killed them with no particular favoritism. At the end of the last book I was screaming at him for pulling me along just to have my heart torn out, and he isn’t even finished writing them! I spent 6 months devoting my free time to immerse myself in his world, and he had me squirming the whole time. Many would argue, including myself, that because he creates such reactions in his readers that he is a writing genius. Yet, sometimes it makes me wonder if he goes too far… Is there a line that can be drawn? My original intent was to be able to watch the TV shows after reading the books. But, it has left me in a serious conundrum. I can’t stand the show. There, I’ve said it. I’ve only watched two episodes of the first season but the show is already too unlike the books to enjoy. It’s frustrating because of how well-loved it is, but there is no going back for me. I could love the people that play the characters (or hate them, they did an AMAZING job casting Joffrey) but the storyline already annoys me just two episodes in. I’ve created a complicated relationship with the books and an even more complicated one with the show. For now I’ll embrace the respite while Martin takes his time figuring out who he’s going to kill off next and viewers of the show bicker over the way the screenwriters are changing the original plot line. At the end of the day, Game of Thrones has been an interesting phenomenon to witness and dive into, but it’s time to come up for air. I am afraid to go down that book rabbit hole…..I watch the show on occasion because my husband does. He has read the books and, initially, he did like the show, apparently very faithful to begin with. I believe we are on season 4 or 5 and he can’t stand it anymore (although he loved the finale…go figure). It is a dangerous one to go down. That’s interesting he liked it in the beginning. I know I could keep watching and enjoy it more, but once again, since the show is so popular I know how far from the books they go in later seasons which turns me off from watching more. It’s one of those things that is so talked about that it killed the appeal for me. I always wonder what would have happened if I just followed the shows first and then read the books. Wow-That’s an interesting way to display something so morbid! I haven’t read the book or seen the show. I just can’t handle that much death! He definitely is walking a fine line with his favorite plot tool. I’m still wondering if it was worth all the anxiety! Thanks for reading! I’m currently reading the very last book and I’ve watched the TV show and I absolutely adore them both! Granted the books are better than the TV show because quite frankly when is the opposite the case? But I am hooked on the TV show, more recently stronger than ever! Granted in the first season I didn’t like that the ages of all of the younger characters had been bumped up a few years but now I just don’t even notice the fact. One thing I love about the TV show is that it provides more depth to characters that appear in the book but never really have their own chapters such as Margaery Tyrell which just draws you in more! I can also imagine that it’s frustrating that now the storyline in the TV show has taken a minor detour but that’s only to keep us going until the books are written and quite frankly who could turn down MORE FROM THE WONDERFUL LANDS OF WESTEROS/ESSOS?! I find with this series I want to know everything about this fictional universe from characters and histories to geography and religions, and I can’t help but love it! I am constantly on the fence and going back and forth because I have family that LOVES the show. But, I think I will give it another try once the book hangover wears off and I get over the whole Jon Snow thing 😉. Thanks for giving me more reason to– I had heard they do more in the show with the minor characters so that’s motivation in and of itself! Thank you so much for reading and sharing your thoughts!